Birthday Lilies Sending a birthday flower is a great way to celebrate love and friendship on that special day. Our lilies come in a dizzying array of stunning colors and distinctive smells. Choose a lily flower bouquet based on your favorite color or scent, or choose our oriental lilies which are shipped from farms in Costa Rica showing that we spare no expense in ensuring we source the best possible flowers available. 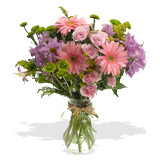 Buy birthday lilies online and let us help you make someone's day even more special.